Ahhhhh, lunch. Whether you pack a lunch for yourself or your husband to take to work, send your kids to school with a lunch box, or eat lunch at home everyday – I believe every one of us can benefit from learning new make-ahead lunch ideas. Since I’m not a fan of the sugar crashes, brain fog, or grumpiness that come after eating or feeding my kids empty carbs and processed foods, nor do I have time to cook complicated meals in the middle of a busy work/school day – I thought putting together a series of posts which include healthy make-ahead lunch ideas would be fun. Are you with me? Do you want some fresh new lunch box ideas? Do you have some ideas of your own to share? Introducing: The Make-Ahead Lunch Box – a new series here at Heavenly Homemakers. Sandwiches are great, and in fact, I’m hoping to put together a fun post full of great sandwich ideas within this series. (Have any to share? Leave a comment to let me know!) But packed lunches, make-ahead lunches, and quick pull-out-of-the-fridge lunches can go way beyond sandwiches. Healthy food that can be prepared ahead of time, then slipped into a lunch box or onto the table with minimal effort? Oh yes, bring it on. From allergy friendly, to picky kids, to figuring out how to include plenty of fruits of vegetables – I think we’re all going to have a lot of fun together as we learn new recipes, tips, and ideas. So let’s get started right away! 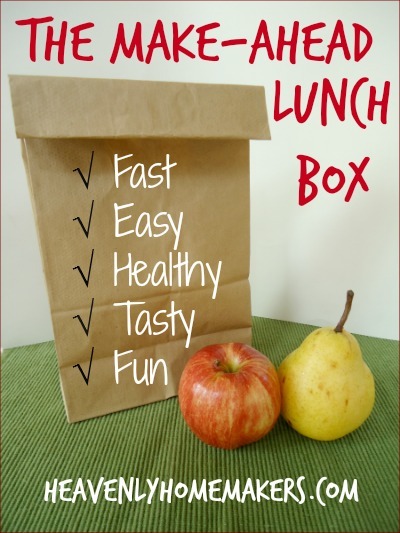 Leave a comment on this post sharing your biggest lunch challenges, your best healthy lunch tips, and favorite lunch-time foods. Can’t wait to hear! I pack my soon to be 1st graders lunch everyday. I’m excited for this series! I pack lunches every night for my husband, and all three of my boys once school starts again. Packing the night before is a must, because I’m not actually awake until I’ve been up for awhile. My boys love it when I make a stew or something in the slow cooker overnight and send their thermos jars to school. I have found a lot of great ideas in the Breakfast and Lunch cookbook that Erin from $5 Dinners wrote. It was her idea to cook overnight so that it is fresh and ready in the morning. We don’t have any allergies or restrictions, fortunately. My boys all love quick breads. A slab (not slice) of banana/zucchini/whatever bread, some cheese, and some fruit will make them happy too. Really looking forward to these posts! I use the fine grate side of my box grater to make carrot “sprinkles” that my oldest puts on her turkey sandwich or wrap. For lunches we take places I like to freeze the Trader Joe’s yogurt tubes for a special treat. They are good frozen or if they sit for a while and thaw they are still tasty and cold. My daughter is tired of sandwiches. What can I do to spice up lunch this year? I have a 3rd grader and a kindergartener. Oh I can’t wait for ideas! I do NOT enjoy packing lunches let alone coming up with new things…woo hoo! Bring it on! My son is starting ore school and even though I have been packing his lunch for the sitter. They will not be able to hear up his lunch at the preschool so I am in need of ideas that do not need to be heated. I only have to pack a lunch for my husband, at the moment. I’d LOVE some inspiration. I used to send dinner leftovers, but he doesn’t have access to a fridge so I’ve transitioned to sandwiches. He doesn’t complain, but I think it gets old to make the same thing every day! (I actually make 4-5 PBJ sandwiches at a time and stick the extras in the freezer so they keep all week.) Can’t wait to see some ideas. I’ve been packing school lunches for 25 years now and still don’t have it down. I currently have school age three children (11-7) that need to eat (funny thing about that) but no one like sandwiches or wraps. I mostly pack chicken nuggets or dinner leftovers, a sweet (homemade cookie or muffin) and fruit, but it’s a challenge to get it all done even the night before. I’d like to get organized enough to have lunch components in the freezer where I/they can just grab and go, so I’m very interested in any and all ideas. Yay! Always looking for new ideas for lunches! Can’t wait to follow and learn new ideas and recipes! Thank you, Laura! Looking forward to this series! For my family we do leftovers most of the time,but there are days that there aren’t any leftovers so then it’s usually sandwiches. Either pb&j or some sort of panini depending on what we have. But no bread-then we are in trouble. Usually we’ll do hard-boiled eggs,cheese,veggies and dip,and fruit. But the last two don’t work for my husband as he can’t make paninis at work and a snacky lunch like the last one doesn’t cut it for him. He really likes meat,but I don’t buy extra meat for lunches as the budget won’t allow that so I try to stretch the meat with soups,casseroles,salads,etc. so he takes the leftovers,but sometimes my estimations are off especially with a growing son and then I don’t know what to do. I love getting new lunch ideas because I’ll admit I tend to circulate the same handful of ideas over and over again. I’m especially interested in lunch ideas that can fill up a hardworking husband’s meat-craving appetite without using store-bought lunchmeat, which I find to be pretty expensive and typically full of all kinds of nasty weird chemicals. When I was working, I’d take a pile of containers for lunch every day. They included leftovers, veggies, dip, yogurt, fruit. Now that I’m home and hubby is working, he gets lunch provided every day, and I make a wrap – bbq tofu, spinach, cheese, tomatoes, cucumber. Yum! I like having the same thing every day. This is one of our favorite lunches! We also really like Laura’s BLT Wraps as a make a head lunch! Cole Slaw is also a great make ahead option—it tastes better the next day after making it anyway, and you can portion it out in smaller containers for lunches! The last thing I wanted to add is something I haven’t tried yet— apple sandwiches. According to the recipe you cut the apple into rings instead of wedges and put your favorite nut butter on one side and put the other apple ring on top and you have an Apple Sandwich. I figure it would go great with Veggies and Dip and maybe some cheese! It just seems like a fun twist on a traditional “snacky” type meal. I’m looking forward to seeing what everyone else is doing and getting some new ideas! I’m very happy you picked this topic Laura! Karli, I have made the “apple sandwiches” for my grandson (11 years old) for a couple of years now. He has taken it in his lunch several times; he also enjoys it as an after-school snack. Works out well – simple to make. Could you please give a lot of ideas for things that don’t need to be reheated or kept especially hot or cold. That’s the real challenge for us. boy A…doesn’t like meats, very selective in veggie and fruit preferences also, has access to a microwave at school but he says the line is too long for reheating any food…will occasionally eat pb&j, but gets tired of it quickly. boy B is fine with sandwich meat but no pb&j, good fruit and veggie eater, but complains that the bento style lunches I was trying to do at the end of last year are not filling enough. boy C is great with most meats, loves his fruits and most veggies, no way to reheat his food and doesn’t like thermoses as he says they do not keep his food hot and they don’t hold enough food anyhow. He also states the bento style lunches don’t have enough food. Wow, you do have some challenges! How old are the boys? I’m thinking they might be old enough to do some of this themselves. Packing big enough lunches is one of my main challenges, too, even though my oldest is only 6, she eats in quantities like an adult (not like a teenager, but not like her peers, either). So far, the best solution I have is to pack lots of fruit & veggies that she likes, in addition to her “main” lunch and some extra protein (piece of cheese, or PB for dipping veggies, or yogurt). Usually the only thing that comes back home is a few of the veggies. My biggest challenge is that my mom is home with my kids during the day and she often isn’t sure what to feed them as she doesn’t know if certain food is there for dinner or something else specific. Being able to preplan meals for them would be great. Looking for healthy ideas for High School boy who needs variety, but has to be cool & has very little time to eat, so finger foods work best. I am so excited about this new series! My children go to a charter school 2 days a week (all four of them!) and I struggle to be creative. Sometimes, I do wraps with tortillas instead of sandwiches. If they are REALLY lucky, I will do a cinnamon-sucanat wrap and it is a happy day! Other than that, lots of sandwiches of all kinds. I dread making lunches again. I only have to pack for my 10 year old daughter (oldest daughter packs her own very processed lunch) but she is dairy allergic so that puts a crimp in lots of things. She also has very little time to eat & no way to what anything up. She’s not a sandwich girl either. Oh Laura!!! You are a woman after my own heart! Why don’t we live next door to each other :) I pack lunches every day for my husband and I and for my teenage daughter I pack a lunch and a hearty snack for after school and before cheerleading (she’s at school for close to 14 hours a day). My problem is for both of them, they don’t have access to a microwave, so it’s always the same old, same old. It would be great if you have any suggestions there :) On another note, to date their favorite sandwich filler, or to eat with celery & crackers is my buffalo chicken salad – cut up/shredded chicken chunks…mix in some hot sauce and your homemade ranch….that’s it!!! So excited for this series and some new ideas. Ever since starting to eat more of a real food diet a couple years ago, lunch has been my nemesis. My husband takes a lunch to work and I home school our 3 children. I just don’t have time in my day to put much effort into lunch! Great timing! I feel like I am in a sandwich rut! I would love some fresh ideas, especially on low-carbs. Very much looking forward to this. My sack lunches need a major overhaul. They are so routine and mundane – same thing day after day. I need variety. I need to get out of the sandwich-fruit-chips-cookie mold. Help me transform lunch!!! Thanks. I am so excited about this series ! My husband likes to eat at the cafeteria but we’ve talked about sending him with yummy homemade lunches at least a few times a week as prices have gone up. Also even though my little ones are 3, 2 and 11 months, they are BIG eaters !! I’m quickly realizing that I need to figure out some options besides leftovers! Nut free options are always appreciated. Nut products are pretty much banned in most Canadian schools. I like to live by the “Previous Planning Prevents Poor Performance” rule. I make lunches for my husband and 13-yr old daughter daily. They are both healthy eaters, and away from home for about 10-11 hours/day. My husband is easy since he eats a big salad everyday for lunch. We just rotate the protein option–HB eggs, grilled chicken, cubed turkey, taco meat, leftover salmon, etc… . At the beginning of every week we basically turn our fridge into a salad bar and just create a salad from whatever veggies are sliced and diced. We also add nuts, raisins, chia seeds, etc… to increase the calorie content and help the salad to keep him satiated for longer. He keeps a bottle of OEVOO and raw apple cider vinegar at work for salad dressing. For my daughter, I have created a list for her to choose from with the categories I want her to draw from: Veggie–baby carrots, mini peppers or pepper slices, cucumber slices, salsa, salad, … Protein/Main Dish–Turkey sandwich/wrap, All beef nitrate free hotdog, leftover pizza, soup, homemade burritos, beans-n-rice, cottage cheese, HB eggs, hummus, PB-on bread, crackers, rice cake, tortilla, etc… Fruit–whatever is in season, sometimes I make a smoothie and put it in her thermos and it stays cold until lunch,… Treat -organic tortilla chips, pretzels, kettle chips, homemade lara bar, fruit leather, homemade cookies/muffins, yogurt. Having the list saves my brain. Every week she creates a menu which helps me shop accordingly, and she assists me in making her lunch. When we fail to plan, we most definitely fail. How do you make a homemade Lara Bar? I’m not sure how well it lines up against a Lara bar but I like to make variations of Joann’s power bars found on allrecipes.com. I find if you keep the ratios pretty balanced between dry and moist ingredients you can do a lot of different combos. I have used almond flour, chia seeds, hemp seeds, shredded coconut, plenty of coconut oil, dried fruit, various nuts, and some chocolate chips and they almost always turn out great. Also makes for a quick breakfast on the run. Thanks so much – can’t wait to give them a try! There are some excellent larabar recipes on realfoodrealdeals.com that use only a few ingredients just like the real labar. Thank you – I am not familiar with that website but I am excited to check it out. Can’t wait for this series! I should be a seasoned lunch packer by now, but alas, after at least 15 years, I am not. The hubbie is pretty easy as long as we have enough leftovers from dinner, but as the kids get older and eat more, that doesn’t always happen, or the opposite is true. I make a dinner meal for 8, and kids have other plans, so I have way too many leftovers that get boring after the 2nd or 3rd day. The only child that doesn’t make his own lunch is my 11yr. old boy who does not like sandwiches particularly. He’ll eat PB&J now and again. If lunch meat is all we have, he prefers the sandwich plain with no mayo, mustard or cheese ( I feel I fail at expanding his culinary experience if I indulge this sandwich!). He prefers hot foods, but doesn’t have access to a microwave at school. Chicken nuggets in foil in the lunch box has worked, but I don’t want to do that every day. As some folks have said in previous comments, thermoses are too small! Anyone have a recommendation for a food thermos that holds more than a cup?? Here’s my challenge–make a grain free, dairy free, and sugar free lunch. I have to do this all the time and so that excludes sandwiches most of the time because of some special diets at this point in our household. I think as talented as you are, this will not be a challenge, but a cinch! -a GOOD thermos. I like Thermos or Coleman brand. Often found in the camping section and will be $12-$15. Buy it. It’s worth it. -a decent sized lunch box with the drink holder on the OUTSIDE. I like Pottery Barn Kids. -stainless steel water bottle. I RARELY send anything but water. I use Thermos brand. -divided container. I like the cheap ziplock brand 3-compartment ones. Most often the kids take leftovers in their thermos. I like to “pre-heat” it with super hot water for 5-min., dump and add heated food. Seems to work well. I put anything and everything in there! Some examples: cut up homemade waffles with PB and syrup, soup, cut up pizza, buttered noodles, oatmeal, homemade chicken nuggets, casseroles, homemade pugs in a blanket, baked potato, etc. Whatever is leftover in the fridge or freezer! Also, for the thermos, I like to make a big batch of soup and freeze servings in Mason jars. I just throw the jar in the fridge to thaw overnight and then heat it for the thermos in the morning. Non-thermos things are where divided containers and muffin cups are handy–the muffin cups fit perfectly to provide more compartments. A favorite is a pizza “Lunchable”—mini pita bread (trader joes), shredded moz, pizza sauce, and nitrate-free pepperoni. They put it all together at lunch. Throw in some baby carrots, fruit and a homemade granola bar and you have a great lunch! Other cold ideas are PB and honey roll-ups, taco or chef salad, pasta salad, etc. I always include a fruit and veg with lunch and sometimes a treat! Hope this is helpful. Making lunches can be kinda fun! I can’t wait to hear more ideas from everyone! I pack lunches for my hubby and myself. Hubby’s is fairly easy to do since he works in an office. Mine however is a big challenge because I work in our local National Forest and am often in the middle of the woods. Trying to pack food that won’t spoil/squish/mangle/etc in my pack, yet be healthy/satisfying/rejuvenating/energizing is my biggest challenge. Fruits and veggies only go so far, and I need higher amounts of protein versus carbs. Any suggestions would be extremely helpful as lunches this summer are getting really boring and unappetizing. I’m looking forward to some new lunch ideas. We work from home and homeschool, so we don’t have to pack lunches out too often. We usually eat leftovers, soups, etc. I could use some more creativity. The challenge for me is that I would like to have something quick, but still frugal. Thanks! I have a senior, 6th grader, and 4th grader and none of them like the same thing for their lunch. However, 3rd grade is when they start packing their lunches, so I just have to make sure they have supplies and occasionally check to make sure the lunches are nutritious (and usually they are). My senior likes to pack leftovers and use the microwave at school to warm them up, so she packs her lunches in small Pyrex containers or glass Snaplock containers for meals that are saucy. My 6th grader loves quesadillas, so tortillas and cheese are usually on hand. Sometimes he adds ham or taco meat, if it’s available. These two lunches are supplemented with muffins or homemade granola bars and a piece of fresh fruit. My 4th grader packs his lunches in the Ziplock lunch containers, the compartments are water tight and the contents vary from day to day. He likes peanut butter and jelly sandwiches or cheese and crackers or yogurt and granola, a muffin or homemade granola bar, and then fruit, whether it be applesauce or fresh fruit cut to fit in a section of his container. They also have a small thermos for taking a hot soup or cold milk in their lunch. A great sandwich that should be better publicized – bacon, avocado, and cheese on toast. It is a take on a BLT that I created during my last pregnancy, and it is so good! As a homeschool mom, my biggest lunch challenge is getting lunch done quick, without a sink foul of dishes to clean up afterward. I would love to have lunch prepared ahead of time so clean up ell be a breeze. I love this idea! I pack three lunches every night (packing the night before is essential!) My three kids have very different taste preferences and I find that quite challenging. My son goes to a nut-free school, my younger daughter can’t have dairy and I’m allergic to nuts and fish, so we don’t have any of that in my home. I just compiled a grocery list plus a complete weekly meal plan based on my three kids’ favorite lunch foods: http://bit.ly/LaLaGroceries. My kids participate in the meal planning process by using the kid-friendly LaLa Lunchbox app – which you can download for free: http:bit.ly/lalalunchbox. They choose foods in advance, usually on saturdays for the week ahead, and those choices immediately become a shopping list for me. It’s simple, fun and engaging with fun monsters, sounds and colors. Interestingly, my kids have been more willing to try new foods just because they see them on the app. My older daughter now loves goat cheese with apple sandwiches or mozzarella/basil sandwiches and my younger daughter loves hummus with carrots and pretzels. My son is singlehandedly keeping the yogurt industry alive and loves things like fruit kebabs to go with it. You can add any new food that you want to the LaLa Lunchbox app Library, so special diets are never a problem. Back to school can be an exciting time but also an overwhelming one. Can’t wait to see what unfolds with this new series and thank you in advance!